Media Matters for America has compiled and debunked myths and falsehoods about Solicitor General Elena Kagan's Supreme Court nomination. Myth: Kagan has said judicial experience is an "apparent necessity"
Myth: Kagan's recusal obligations would be "extraordinary"
Myth: Kagan "can become" too "emotionally involved on issues she deeply cares about"
Myth: Kagan not "fair-minded, impartial" and doesn't have "proper temperament to be a judge"
CLAIM: Kagan's policies regarding military recruiters at Harvard indicate that she is an "anti-military" "radical" who "defied" the law . Phyllis Schlafly claimed in her March 31 syndicated column that Kagan "defied the Solomon Amendment" -- a statute requiring schools to provide the same access to military recruiters that they provide to other potential employers or lose federal funding. Liz Cheney called Kagan's actions "radical," and other conservatives have also distorted Kagan's position regarding military recruiters on Harvard Law School's campus. And The Washington Times published a 2009 op-ed referring to Kagan as "an anti-military zealot." [Kagan's] management of the recruiting dispute shows her to have been, above all, a pragmatist, asserting her principles but all the while following the law, so that Harvard never lost its financing. Moreover, during her confirmation hearing as solicitor general in 2009, Kagan pledged to defend the Solomon Amendment. "For someone who has been so guarded on so many issues, she used strikingly extreme rhetoric. 'Moral injustice of the first order' would seem fit for something like the Holocaust," said Ed Whelan, president of the conservative Ethics and Public Policy Center. "This is one issue that provides some jurisprudential clues as to how much her reading of the law will be biased by her policy views. If she is the nominee, that is an angle that I would press." Whelan has separately clamed that the fact that Kagan relented to Bush administration pressure to allow military recruiters to access the career center is evidence that Kagan is a hypocrite who engaged in "cheap and contemptible moral posturing." REALITY: Kagan's objections to DADT are mainstream, and her willingness to comply with and, as solicitor general, defend the Solomon Amendment demonstrate devotion to the rule of law. Kagan's moral objection to Don't Ask, Don't Tell is hardly "extreme." For example, Adm. Mike Mullen, the chairman of the Joint Chiefs of Staff, has suggested that the ban on openly gay service members compromises the military's "integrity." Moreover, Kagan's decision to abide by the Solomon Amendment doesn't indicate hypocrisy; it indicates a commitment to the rule of law. FACT: Kagan allowed military recruiters access to Harvard Law School's Office of Career Services. In the 1990s, based on its anti-discrimination policy, Harvard Law School refused to allow military recruiters to use the school's Office of Career Services (OCS) because of the military's discriminatory Don't Ask, Don't Tell policy. In 2002, after the Bush administration threatened federal funding at Harvard, Kagan's predecessor as dean created an exception to Harvard's anti-discrimination policy and allowed military recruiters access to OCS. When Kagan became dean in 2003, she continued to allow military recruiters access to OCS. FACT: After an appellate court -- including a Reagan appointee -- ruled Solomon Amendment unconstitutional, Kagan prohibited Harvard's career office from working with recruiters for one semester. In 2004, a three-judge panel of the 3rd Circuit held 2-1 in FAIR v. Rumsfeld that the Solomon Amendment violated First Amendment free-speech rights: "The Solomon Amendment requires law schools to express a message that is incompatible with their educational objectives, and no compelling governmental interest has been shown to deny this freedom." Judge Walter Stapleton, a Reagan appointee, joined the majority opinion in the case. Following the 3rd Circuit's ruling, Kagan reinstated the ban against military recruitment through OCS for one semester in 2005. After the Bush administration threatened to revoke Harvard's federal funding, Kagan once again granted military recruiters access to OCS. In 2006, the Supreme Court reversed the 3rd Circuit decision. The Law School's anti-discrimination policy, adopted in 1979, provides that any employer that uses the services of OCS to recruit at the school must sign a statement indicating that that it does not discriminate on various bases, including sexual orientation. As a result of this policy, the military was barred for many years from using the services of OCS. The military retained full access to our students (and vice versa) through the good offices of the Harvard Law School Veterans Association, which essentially took the place of OCS in enabling interviews to occur. I reinstated the application of our anti-discrimination policy to the military (after appropriate consultation with University officials) in the wake of the Third Circuit's decision; as a result, the military did not receive OCS assistance during our spring 2005 recruiting season. FACT: Military veterans at Harvard Law dispelled notion that Kagan was "anti-military." Military veterans at Harvard Law School strongly dispute the idea that Kagan was anti-military and stated that she had a "strong record of welcoming and honoring veterans on campus." In response to the Washington Times op-ed, three military veterans who were Harvard law students at the time wrote a letter to the Judiciary Committee that said, in part: "As Iraq War veterans who currently attend Harvard Law School, we wanted to inform the Committee of Dean Kagan's strong record of welcoming and honoring veterans on campus." The veterans also wrote a letter to The Washington Timesthat stated, in part, that while they opposed the restrictions on military recruiters, "During [Kagan's] time as dean, she has created an environment that is highly supportive of students who have served in the military." FACT: Dozens of law professors, other law schools, and the Cato Institute argued against government's interpretation of Solomon Amendment. Kagan's legal actions and statements regarding Don't Ask, Don't Tell were by no means extreme. As Media Matters has documented, Kagan joined a brief filed on behalf of 40 Harvard law professors arguing against the government's interpretation of the Solomon Amendment. Briefs filed on behalf of 100 other law professors also argued against the Solomon Amendment or the government's interpretation of that amendment, as did other organizations, including the Cato Institute. FACT: Numerous law schools restricted military recruiters' access because of the discriminatory "Don't Ask, Don't Tell" policy. The Joint Appendix filed in connection with the appeal of FAIR v. Rumsfeld to the Supreme Court contains statements from numerous law professors detailing their law schools' attempts to restrict military recruiters' access to career services offices. Following the 3rd Circuit's decision, in addition to Harvard, Yale and New York Law School also reportedly reinstituted their restrictions against military recruiters. For me, personally, it comes down to integrity -- theirs as individuals and ours as an institution. CLAIM: Kagan is a "radical" who is "outside the mainstream." Conservatives have indicated they will brand any Obama Supreme Court nominee -- including Kagan -- as a radical. For example, conservative activist Richard Viguerie has reportedly said, "The more quickly we can identify [the nominee] as an ideological liberal, the easier it is for us to communicate to the American people how radical the president is and the nominee is." Similarly, Glenn Beck has said that President Obama is going to pick a "radical" nominee. In a March 19, 2009, Family Research Council Action press release, Tony Perkins claimed that Kagan "is well outside the mainstream of public opinion and to the left even of President Obama." FACT: Kagan is considered to be relatively moderate. Reuters noted on May 7 that Kagan is "considered one of the more moderate choices on Obama's short list of potential court nominees." FACT: Numerous conservatives have praised Kagan. NRO's Daniel Foster praised Kagan as being "well-respected by just about everybody on both sides." In an April 9 post on The Corner, National Review Onlinenews editor Daniel Foster wrote that Kagan "is well-respected by just about everybody on both sides." Bush assistant AG: "Kagan combines principle, pragmatism, and good judgment better than anyone I have ever met." In a letter supporting Kagan's nomination for solicitor general, Jack Goldsmith -- former assistant attorney general for the Office of Legal Counsel during the Bush administration -- stated: "It might seem over the top to say that Kagan combines principle, pragmatism, and good judgment better than anyone I have ever met. But it is true." The well-deserved stature that Kagan has achieved in the legal profession will enhance her tenure as Solicitor General, ensuring that, within the executive branch, her voice and the conclusions reached by the Solicitor General will be accorded the highest respect. The extraordinary skill she has demonstrated in bringing to Harvard an impressive array of new scholars, her ability to manage and lead a complex institution, and the high regard in which she is held by persons of a wide variety of political and social views, suggest that she will excel at the important job of melding the views of various agencies and departments into coherent positions that advance the best interests of the national government. Her legal acumen is more than equal to the task she faces, as reflected in her scholarship. The spirit of toleration and fair-minded consideration of competing views she brought to the Deanship reflect the sort of temperament and judgment that will inspire confidence in the Justices of the Supreme Court as well as the private parties with whom she will need to interact as SG. The same institutional loyalty that has enabled her to put Harvard Law School's interests ahead of her own will undoubtedly cause her to do likewise in service of the United States. Steve Hayes: Kagan is "persuasive to people who might not otherwise be predisposed to agree with her." On the May 7 edition of Fox News' Special Report with Bret Baier, Fox News contributor Steve Hayes stated that Kagan is "someone who can make convincing and compelling arguments and marshal her arguments in a way that is persuasive to people who might not otherwise be predisposed to agree with her. And I think you're seeing that to a certain extent in the sort of half-embrace that she's getting from some conservatives, particularly conservative academics." CLAIM: Kagan's thesis shows that she was a radical or a socialist. In a May 6, 2009, Weekly Standard blog post, Michael Goldfarb wrote that Kagan's college thesis -- which was titled "To the Final Conflict: Socialism in New York City, 1900-1933" -- demonstrates Kagan's supposed "radical roots" and that "her political sympathies (at the time) seem quite clear -- and radical." In a May 3, 2010, National Review blog post, Ed Whelan cited Kagan's thesis as evidence that she "was well on the Left" at the time. Whelan wrote: "To be clear: I am certainly not contending that Kagan's views might not have changed over the years; I am merely pointing out the utter dearth of evidence that Kagan might secretly harbor conservative views." REALITY: Kagan is not and was not a radical or a socialist; her thesis simply explored historical questions about socialism. Kagan did not express personal support for socialism or radicalism in her thesis. Rather, she explored the historical question of why socialism did not become a major political movement in the United States as it had elsewhere in the world. Kagan's thesis adviser has said that Kagan has never been a socialist, and one of her college peers described her views in college as "well within the mainstream of the ... sort of liberal, democratic, progressive tradition." Despite the fact that Kagan's thesis is publicly available, Republicans did not raise the issue during her confirmation as solicitor general, suggesting that none of them believed that she was actually a socialist. FACT: Kagan's thesis did not state that she is a socialist. Kagan's 130-plus-page undergraduate senior thesis, which she wrote as a history student at Princeton in 1981, discussed the rise and fall of socialism in New York City in the early 20th century, with a particular emphasis on why the movement collapsed. At no point in the thesis did Kagan say she personally supported socialism. FACT: Republicans did not raise thesis "socialism" issue during Kagan's solicitor general confirmation. The title of Kagan's thesis is publicly available on Princeton's website, and the thesis itself can be easily obtained by contacting Princeton. Thus, if Republicans actually believed the thesis is evidence that Kagan harbored socialist views, they presumably would have raised the issue during her confirmation for solicitor general in 2009. But at no point during Kagan's February 10, 2009, Senate hearing, the written questions following the hearing, or the March 19, 2009, floor debate on her nomination did any senator -- Republican or Democratic -- address Kagan's undergraduate thesis or concerns that she held socialist beliefs. Under [history professor Sean] Wilentz's direction, Kagan spent her senior year conducting research for her thesis on the history of the socialist movement, which was titled "To the Final Conflict: Socialism in New York City, 1900--1933." Her thesis has been criticized by her opponents for revealing sympathies with the Socialist Party and became a source of controversy when she was a potential nominee for Associate Justice David Souter's seat on the Supreme Court last spring -- a position which instead went to Sonia Sotomayor '76 -- and when she was nominated for her current position of solicitor general in January 2009. "Americans are more likely to speak of a golden past than of a golden future, of capitalism's glories than of socialism's greatness," she wrote in her thesis. "Conformity overrides dissent; the desire to conserve has overwhelmed the urge to alter. Such a state of affairs cries out for explanation." She called the story of the socialist movement's demise "a sad but also a chastening one for those who, more than half a century after socialism's decline, still wish to change America ... In unity lies their only hope." But Wilentz defended Kagan against her critics, noting that she was adept at removing her personal beliefs from her academic research on labor and radical history. "Sympathy for the movement of people who were trying to better their lives isn't something to look down on," he explained. "Studying something doesn't necessarily mean that you endorse it. It means you're into it. That's what historians do." Kagan said in her thesis acknowledgements that her brother's "involvement in radical causes led me to explore the history of American radicalism in the hope of clarifying my own political ideas." Yet even if a deeper understanding of the Socialist movement helped Kagan understand her own beliefs, she did not follow her brother's path. "Elena Kagan is about the furthest thing from a socialist. Period. And always had been. Period," Wilentz explained. Princeton History Professor Sean Wilentz, who served as Kagan's thesis advisor (and who has previously written for Salon) told Salon that she is not a socialist, and that the question she was asking with the paper "was an absolutely standard" one about why the U.S. hasn't had the same kind of radical movements that have flourished in the rest of the world. "Was she sympathetic to the socialists? Only insofar as the socialists were raising urgent issues about industry and labor even before unions were quite legal nationwide," Wilentz says. He added, "I'm proud of [the thesis]... I wasn't the only one who liked it. She went on to win the Sachs fellowship to Oxford, which is about as prestigious a fellowship as Princeton awards." In light of this speculation, Michael Goldfarb '02 argued in a blog post last week for The Weekly Standard that it is important to closely examine Kagan's undergraduate thesis on socialist movements in early 20th-century New York, saying it indicates political attitudes "sympathetic to the socialists." Several people here at the University who knew her as an undergraduate, however, said Kagan is not a political radical. "She's been called a left-wing crazy for what she wrote under my direction," said history professor Sean Wilentz, who was Kagan's thesis adviser. "I gather that [the] publicists ... of the conservatives are trying to raise all kinds of bogeymen around her. That is a mark of how formidable a candidate she would be." Calling her "the opposite of an ideologue," Wilentz added that he thinks Kagan would be a "very pragmatic liberal" voice if nominated to the Supreme Court. "There's nothing dogmatic about her approach," said Steven Bernstein '81, who worked with Kagan at The Daily Princetonian, where she served as the editorial chairman of the 104th Managing Board. He noted especially that "[Kagan's] views on presidential power and executive power were sometime more in line with Republicans." Marc Fisher '80, one of Kagan's classmates at the University and someone who also knew her from her days at Hunter College High School in New York, also emphasized Kagan's moderate approach during her college years to social issues like apartheid in South Africa. "She was not the kind of person who would get involved in [anti-apartheid] protests [at Princeton]," Fisher said. "She could step back and observe. She was not one of the people who would bang on doors and hold sit-ins." Fisher and other classmates also said Kagan was a thoughtful and studious undergraduate during her years at the University. "[Kagan] was very deliberate in her thought process-extremely focused and balanced in her judgments," Jason Brown '81 said. "A lot of college kids would start with the conclusion and then look for the facts to back it up. I didn't have that sense with Elena." Fisher echoed Brown's sentiment, saying, "She has always been a very devoted and serious student and someone who's always had a purpose about her." Like Wilentz, Steven Bernstein '81, the 'Prince' chairman who appointed Kagan to her position, said that Kagan's remarkable intellectual capacity made her stand out. "Elena was an obvious choice for me as editorial page editor because she formulated her opinions beautifully, even back then," he said. "They were very tightly reasoned, clearly thought-out, fair, forceful, cogent." Bernstein said that he could not recall Kagan discussing her political affiliations, in spite of the long hours they spent together -- and the long conversations they had -- and does not even know if she was registered to vote. Because of her affiliation with the 'Prince,' Kagan was prohibited from participating in any obvious political displays. "I don't remember her participating in marching, protesting, things like that," he said. "I would probably describe her back then -- her politics -- as progressive and thoughtful but well within the mainstream of the ... sort of liberal, democratic, progressive tradition, and everything with lower case." CLAIM: Kagan must abide by her 15-year-old argument that nominees should answer questions on issues that will come before the Court. Whelan published a May 3 blog post titled "The Kagan Standard on the Supreme Court Confirmation Process." Whelan wrote: "Given the possibility that President Obama will nominate Solicitor General Elena Kagan to the Supreme Court, it's worth highlighting that Kagan has set forth in writing her carefully considered views on how the Supreme Court confirmation process ought to proceed." Whelan included quotes from a book review Kagan wrote in 1995 on the subject of judicial confirmations, in which Kagan argued -- in the words of the Los Angeles Times -- that nominees should be "forced to say what they think about disputed issues such as abortion, affirmative action and privacy." Neither Whelan nor the Times noted that Republicans currently on the Senate Judiciary Committee have argued that it would be improper to require nominees to answer such questions. REALITY: Roberts and Alito repeatedly refused to answer questions, and Republicans suggested it would be improper for them to do so. During their confirmation hearings, both Roberts and Alito repeatedly refused to answer questions about their opinions on legal issues and other topics. They often cited the fact that cases involving those issues might come before them as judges. Republicans currently serving on the Judiciary Committee agreed that it would be improper for Roberts and Alito to answer such questions. Moreover, Sen. Orrin Hatch (R-UT) has already suggested that Kagan shouldn't be held to the arguments set forth in her book review. FACT: Roberts repeatedly refused to answer questions during his confirmation hearing. According to a September 15, 2005, The New York Times article, Roberts refused to answer questions on more than 50 occasions. FACT: Alito also repeatedly refused to answer questions. During his 2006 hearing, Alito also refused to answer questions on numerous occasions. FACT: Republican senators suggested it would be improper for Roberts and Alito to answer questions on specific issues that might come before the Supreme Court. Kyl said Roberts refusing to answer questions "in ways that could signal how he might rule" is "the proper standard." Before the September 22, 2005, vote on Roberts' nomination to the Supreme Court, Kyl stated: "In my opening remarks, I told John Roberts that I would defend his position in complying with the canons of judicial ethics, and the traditions of the committee not to testify in ways that could signal how he might rule on a matter that was likely to come before the court. That is the proper standard, he adhered to that standard, and I defend his right to do so" (from Nexis). Cornyn: "No one is entitled to know ... how Judge Roberts will rule" on hot-button issues. During the September 22, 2005 edition of PBS' The NewsHour with Jim Lehrer, Cornyn stated: "I submit that particularly in courts of law, no one -- no one is entitled to know ahead of time what the outcome will be because the very premise of our judicial process is that courts are supposed to be fair and listen to both sides, or all sides of an argument. The judges are supposed to be disinterested in the outcome, and impartial, and that judges finally be independent of the political process. So no one is entitled to know what Judge Roberts -- how Judge Roberts will rule on these hot-button issues of the day. No one is." Hatch: "Nominees may not be able to answer questions that seek hints" about how they would rule. During the Roberts hearing, Hatch stated: "Nominees may not be able to answer questions that seek hints, forecasts or previews about how they would rule on particular issues." He later added: "Nominees may not be able to answer questions asking them to opine or speculate about hypotheticals outside of an actual case with concrete issues and real facts." Grassley: "I'm hoping we won't see a badgering of the nominee about how he'll rule on ... possible issues that will or may come before the Supreme Court." Also during the Roberts hearing, Sen. Charles Grassley (R-IA) stated: "I'm hoping that we won't see a badgering of the nominee about how he'll rule on specific cases and possible issues that will or may come before the Supreme Court." Grassley also said, "And let me remind my colleagues that Justices Ginsburg and Breyer refused to answer questions on how they would rule on cases during their confirmation hearings." HATCH: Even about votes they would cast. How do you square this with the principle that judges must be impartial and with the oath they take to provide justice without respect of persons? KAGAN: It's a great question, Senator. And I'm not sure that, sitting here today, I would agree with that statement. HATCH: If you want to know the truth, I remember when Judge Bork was here. He has written some outlandish things from time to time. But he was absolutely brilliant. And he did it more as an academic, as a teacher. And some on this committee held that against him very badly. But the fact of the matter is that I don't -- I think it's good for teachers to raise all kinds of issues and all -- on all sides of cases. HATCH: And you're good at that. KAGAN: Well, thank you, Senator. I was just going to say, you know, I wrote that when I was in a position of sitting where the staff is now sitting, and feeling a little bit frustrated that -- that I really wasn't understanding completely what the judicial nominee in front of me meant, and what -- what -- what she thought. But I think that you're exactly right, of course, that there are other -- that -- that this has to be a balance. The Senate has to get the information that it needs, but as well, the nominee for any particular position, whether it's judicial or otherwise, has to be protective of -- of certain kinds of interests, and you named the countervailing ones. HATCH: Let me just say that I may not agree that Thurgood Marshall was the greatest attorney of the last century, but I agree with you. He's one of the greatest. And I have nothing but respect for what he did for the civil rights community, and the courage that he had in doing that. And so I think -- I just commend you for having had the privilege for working with him, and others on the Supreme Court who were giants at that time when you were there. So I think you've had some tremendous experiences in your life. And -- and naturally, I respect that. CLAIM: Current SEC charges against Goldman Sachs are somehow relevant to Kagan's nomination. On May 7, The Washington Post's Howard Kurtz wrote, "Elena Kagan was a paid adviser to Goldman Sachs? What could be worse -- being on the offshore risk committee for BP?" FACT: Kagan was a member of a Goldman Sachs advisory panel that met once a year and wasn't involved in investment decisions. USA Today reported last month that Kagan served on a Goldman Sachs "panel from 2005 through 2008, when she was dean of Harvard Law School, and received a $10,000 stipend for her service in 2008, her disclosure forms show." USA Today added that the group "met once a year to discuss public policy issues and was not involved in any investment decisions, Justice Department spokesman Tracy Schmaler said." The Global Markets Institute, Goldman Sachs' public policy research unit, was not involved in the conduct being challenged by the SEC. The council Kagan served on is a group of outside experts called on to organize discussions and examine public policy issues. The institute provides analysis and advice to Goldman Sachs and its clients. Whelan: Blaming Kagan for alleged Goldman wrongdoing is "ludicrous." Even Whelan, a conservative critic of Kagan, noted, "It would strike me as ludicrous for anyone to suggest that Kagan's advisory role on the Goldman Sachs GMI panel had any causal connection to whatever wrongdoings Goldman Sachs is alleged to have committed." CLAIM: Conservative opposition to Kagan is based on good-faith, substantive objections. Media reports have suggested that conservative opposition to Kagan is rooted in good-faith objections to her judicial philosophy, often failing to note that conservatives have indicated they will oppose -- for political reasons -- anyone Obama nominates. For example, on the April 25 broadcast of Fox News Sunday, host Chris Wallace did not challenge Senate Minority Leader Mitch McConnell's assertion that Republicans are "going to treat" the eventual nominee "fairly and go through the process of looking at the record of the individual" (transcript from the Nexis database). REALITY: Conservatives signaled they would attack whoever Obama nominated. Richard Viguerie, a conservative fund-raiser who is developing direct-mail and Internet campaigns about the coming nominee, said conservatives relished the prospect of a fight with Democrats over the Supreme Court before the November election. "The more material he gives us to work with, the easier the battle will be," Mr. Viguerie said. "The more quickly we can identify that person as an ideological liberal, the easier it is for us to communicate to the American people how radical the president is and the nominee is." Torture-memo author John Yoo urges Republicans to filibuster whoever Obama nominates. University of California law professor John Yoo -- who is most famous for drafting the so-called "torture memos" -- used his May 2 Philadelphia Inquirer column to urge a filibuster of Kagan, Merrick Garland, or Diane Wood should Obama nominate one of them. Yoo wrote that a filibuster "would have little to do with these three distinguished lawyers, and everything to do with President Obama and his Senate allies." Coulter urges "huge court battle" to benefit GOP election hopes. On April 12, conservative Ann Coulter said: "A huge court battle is fantastic for Republicans. The reason the Democrats need the courts to legislate for them is their ideas are heinous to the American people. They can't win in democracy, so they do it through the courts. This is always good to have a fight over the courts." Hannity agreed that a court battle is good idea "whether you win or lose." In response to Coulter's statement that "it's always good to have a fight over the courts," Fox News host Sean Hannity said: "I agree with you -- whether you win or lose." National Review: "The question for conservatives will be not whether but how to oppose Obama's nominee." An April 9 National Review editorial stated: "We know that President Obama will nominate a replacement who is also committed to imposing liberal policy outcomes over the objections of legislatures and without constitutional warrant. We know because Obama told us so, pledging during the campaign to nominate only justices who would support constitutionalized abortion." It later added: "Unless Obama provides evidence of having dropped his litmus tests, the question for conservatives will be not whether but how to oppose Obama's nominee." Kathleen Parker: In public, GOP will "be open-minded"; privately, "they'll try to figure out how to derail the nominee." During an April 13 online discussion,Washington Post columnist Kathleen Parker said about Republican strategy regarding the Supreme Court: "In public, they'll be open-minded; behind closed doors, they'll try to figure out how to derail the nominee. I hope the president will go moderate on this one. I think the nation is suffering battle fatigue and could use a respite. If he does, Republicans will have no basis for opposition." Gloria Borger: Some conservatives "looking for a fight" over Supreme Court nomination to "unite the base." During the April 9 edition of CNN's Newsroom,senior political analyst Gloria Borger stated, "There are conservatives ... outside the Senate who are looking for a fight, because they believe that this would unite the base." Beck: Obama will find a "gay. handicapped black woman who's an immigrant" who's a "radical" justice like Sotomayor. On the April 9 edition of his radio show, Glenn Beck said of the then-upcoming Supreme Court nomination, "[M]ark my words. A radical is coming." He later said: "He's going to pick another radical. "Beck added that if Obama's "smart," he'll nominate a "gay, handicapped black woman who's an immigrant." Republicans, who are limited by their minority status, will aim to gain from the process a platform to argue against judges that in their view go beyond rendering legal opinions and deliver rulings on the basis of politics or personal preference rather than the law. The clearest example of disagreement between the legal philosophies of Obama, who was a constitutional law professor at the University of Chicago, and conservatives is the president's "empathy standard." Obama articulated his desire that judges have "empathy" during the nomination process for Sonia Sotomayor, his first nominee to the court, who was confirmed last year. REALITY: Obama -- like numerous conservatives -- has called for both empathy and devotion to the law. Obama has said that he seeks nominees who are dedicated to "the rule of law" and "our constitutional tradition" and who also exhibit empathy. In the past, numerous conservatives have touted nominees' "empathy," "compassion," and personal experience as qualifications, and conservative nominees have similarly highlighted the role that their life experiences have played in their judging. Obama in 2009: "I will seek" a nominee who has the "quality of empathy" and "is dedicated to the rule of law." In 2009, media fixated on a statement Obama made -- "I view that quality of empathy, of understanding and identifying with people's hopes and struggles as an essential ingredient for arriving at just decisions and outcomes" -- to push the notion that this statement "aggravates those who believe justices should follow the Constitution and legislative intent." But in the very next sentence, Obama stated: "I will seek somebody who is dedicated to the rule of law, who honors our constitutional traditions, who respects the integrity of the judicial process and the appropriate limits of the judicial role." Obama added, "I will seek somebody who shares my respect for constitutional values on which this nation was founded, and who brings a thoughtful understanding of how to apply them in our time." Obama in 2010: "I will seek" nominee who has "a fierce dedication to the rule of law, and a keen understanding of how the law affects the daily lives of the American people." In an April 9, 2010, statement on the retirement of Supreme Court Justice John Paul Stevens, Obama reiterated that he would seek someone who has both "a fierce dedication to the rule of law" and a "keen understanding of how the law affects the daily lives of the American people." Obama added that he will seek a nominee "who, like Justice Stevens, knows that in a democracy, powerful interests must not be allowed to drown out the voices of ordinary citizens." FACT: Alito highlighted the importance of his personal experience. During his confirmation hearing in 2006, Justice Samuel Alito highlighted his compassion for people involved in immigration and discrimination cases and discussed the importance of his personal experience, saying: "When I get a case about discrimination, I have to think about people in my own family who suffered discrimination because of their ethnic background or because of religion or because of gender. And I do take that into account." I believe, Senator, that I can make a contribution, that I can bring something different to the Court, that I can walk in the shoes of the people who are affected by what the Court does. You know, on my current court I have occasion to look out the window that faces C Street, and there are converted buses that bring in the criminal defendants to our criminal justice system, bus load after bus load. And you look out and you say to yourself, and I say to myself almost every day, "But for the grace of God there go I." So you feel that you have the same fate, or could have, as those individuals. So I can walk in their shoes and I could bring something different to the Court. Bush cited Thomas' "great empathy." Bush cited Thomas' "great empathy" in his remarks announcing he was nominating Thomas to serve on the Supreme Court. Bond cited Thomas' "compassion and understanding." Bond similarly stated: "Though his skills as a lawyer and a judge are obvious, they are not, in my view, the only reason that this committee should vote to approve Judge Thomas's nomination. Just as important is his compassion and understanding of the impact that the Supreme Court has on the lives of average Americans." Yoo touted the unique perspective that he said Thomas brings to the bench. In his review of Thomas' 2007 memoir, My Grandfather's Son (HarperCollins), Yoo touted the unique perspective that he said Thomas brings to the bench. Yoo wrote that Thomas "is a black man with a much greater range of personal experience than most of the upper-class liberals who take potshots at him" and argued that Thomas' work on the court has been influenced by his understanding of the less fortunate acquired through personal experience. Thurmond repeatedly highlighted importance of "compassion" in Supreme Court justices. During the confirmation hearings for Justice Ruth Bader Ginsburg, Thurmond stated that "compassion" was one of the "special qualifications I believe an individual should possess to serve on the Supreme Court," adding that "[w]hile a nominee must be firm in his or her decisions, they should show mercy when appropriate." Similarly, during the confirmation hearings for Justice Stephen Breyer, Thurmond said "compassion" was among "the special criteria which I believe an individual must possess to serve on the Supreme Court." D'Amato cited Sotomayor's "compassion" in supporting her nomination as an appellate court judge. During a 1997 Senate Judiciary Committee hearing on the confirmation of several judicial nominations, D'Amato stated: "I predicted to this committee, almost five years ago, that Judge Sotomayor would be an exemplary, outstanding justice. She has demonstrated that, repeatedly. She has shown compassion, wisdom, one of the great intellects on the court." DeWine wanted Roberts to "bring to the court your compassion." During Chief Justice John Roberts' confirmation hearing, DeWine stated: "We need you to bring to the court your compassion and your understanding for the lives of others who haven't been as successful as you have been." DeWine continued: "We need you to bring to the court your strong commitment to equal justice for all. And we need you to always remember that your decisions will make a real difference in the lives of real people." CLAIM: Kagan "lacks the one qualification that every member of the current Supreme Court possesses: past judicial service." Whelan has highlighted a New York Times article that states, "Ms. Kagan has a glittering résumé. But it lacks the one qualification that every member of the current Supreme Court possesses: past judicial service. The possibility that she will be nominated has ignited a debate over what scholars call 'the norm of prior judicial experience.' " Whelan complained that the Times had compared Kagan's experience to Chief Justice John Roberts, who had been a judge for only two years when he was nominated for a position on the Supreme Court. FACT: At least 38 justices did not have prior judicial experience. According to University of Virginia government professor emeritus Henry J. Abraham's book, Justices, Presidents, and Senators: A History of Supreme Court Appointments from Washington to Bush II, 38 justices had no prior judicial experience when they were first appointed to the Supreme Court. FACT: Two of the past four chief justices did not have prior judicial experience. William Rehnquist and Earl Warren -- two of the past four chief justices -- had never been judges before their appointments as justices. Both were nominated by Republican presidents. FACT: Former Chief Justice John Marshall and former associate Justices Louis Brandeis and Felix Frankfurter had no prior judicial experience. Former Chief Justice John Marshall, frequently referred to as the "great chief justice," and former associate Justices Louis Brandeis and Felix Frankfurter also had no judicial experience at the time of their Supreme Court appointment. FACT: Kagan has not had judicial experience because GOP blocked her nomination. Kagan was nominated to the U.S. Court of Appeals for the District of Columbia Circuit in 1999 by President Clinton, and the Senate, then controlled by Republicans, blocked her nomination. 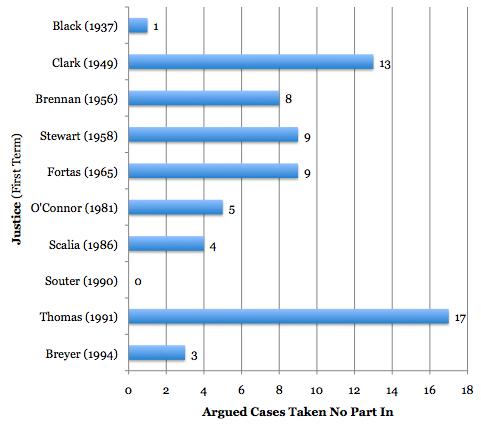 FACT: Clarence Thomas had been a judge for only 16 months when he was nominated for a Supreme Court position. Thomas had only been a judge for 16 months when George H.W. Bush nominated him for the Supreme Court. CLAIM: Kagan "flunk[ed]" her own criteria that a nominee has "master[ed] the 'craft' aspect of being a judge." In a May 3 post, Whelan wrote that "Elena Kagan would seem to flunk the 'threshold' test that she set forth for Supreme Court nominees. In particular, she seemed to put a much higher premium on the value -- indeed, the apparent necessity -- of previous judicial experience than those who now promote her candidacy." After including an excerpt from an article Kagan wrote, Whelan stated: "I don't doubt Kagan's 'skills' and 'aptitude,' but I see nothing in her record that indicates that she has 'master[ed] the "craft" aspects of being a judge.' "
REALITY: Kagan specifically stated that judicial service isn't necessary. As the excerpt Whelan himself included in his post showed, Whelan misrepresented Kagan's quote. She actually said that a judicial nominee must demonstrate the "ability ... to master the 'craft' aspect of being a judge": "It is an embarrassment that the President and Senate do not always insist, as a threshold requirement, that a nominee's previous accomplishments evidence an ability not merely to handle but to master the 'craft' aspects of being a judge." Indeed, in the same paragraph from which Whelan quotes, Kagan made clear that judicial experience is not required. Kagan said she believes a nominee may instead "demonstrate the requisite intelligence and legal ability through academic scholarship, the practice of law, or governmental service of some other kind." Kagan has served as an academic, practiced law before the Supreme Court as solicitor general, and served in government both as solicitor general and a policy adviser to Clinton. FACT: Kagan has written or signed off on dozens of Supreme Court briefs as solicitor general. Kagan wrote or signed off on dozens of Supreme Court briefs as solicitor general in 2009 and 2010. On the other hand, service as solicitor general, or S.G., is exceptionally good preparation for a job as a justice, said Lincoln Caplan, the author of "The Tenth Justice: The Solicitor General and the Rule of Law." "The S.G.'s office reads the Supreme Court, both its personnel and its opinions, as closely as anyone in the universe," Mr. Caplan said. The office's approach is, moreover, a practical one, aimed at capturing the votes of a majority of the nine justices. "The S.G. learns to count to five," he said. FACT: Legal experts agreed that Kagan had the skills to be superb solicitor general. Legal luminaries, including all of the people who served as solicitors general from 1985-2009, six former assistant solicitors general, the NAACP Legal Defense and Education Fund president and director-counsel John Payton, former Bush administration White House counsel Bradford Berenson, Harvard Law professors Charles Fried and Laurence Tribe, and many others supported Kagan's nomination to be solicitor general, and said she would be outstanding in that role. FACT: Kagan spent years as constitutional law professor. According to her biographical information on the Office of the Solicitor General website, Kagan taught constitutional law while on the faculty at Harvard University. FACT: Kagan clerked for Thurgood Marshall. Kagan clerked for Justice Thurgood Marshall in 1988. CLAIM: Kagan's actions as solicitor general and an article she wrote as a professor show that she will give great deference to the president on national security issues. Referring to a law-review article written by Kagan and her record as solicitor general, Whelan wrote that a New York Times article presents concerns "Kagan 'may lean too far toward the middle.' Those concerns (and the corresponding hopes from some conservatives) may well be warranted on national-security issues and executive power more generally." Politico's Mike Allen has also suggested that Kagan may be attacked for being too deferential to presidential power on national security issues. REALITY: Kagan's article dealt with domestic issues, not national security, and her actions as solicitor general do not show that she would take an expansive view of the president's national security powers. Kagan's article dealt with a president's power to direct administrative agencies and did not claim, as the Bush administration had, that the president had inherent power to act unilaterally on national security matters. Furthermore, Kagan's arguments in favor of the government's national security positions as solicitor general do not indicate that she would take an expansive view of the president's national security powers as a Supreme Court justice. As she has stated, her duty as solicitor general was to represent the federal government in court and defend federal laws whether or not she agreed with them. As a justice, her role would be to decide whether the federal government's actions are justified under the Constitution and federal laws. I have argued here that this development, within broad but certain limits, both satisfies legal requirements and promotes the values of administrative accountability and effectiveness. Presidential administration as most recently practiced -- including, most controversially, the use of directive authority over executive branch agencies -- comports with law not because, as some have claimed, the Constitution commands straight-line control of the administrative state, but because, contrary to prevailing wisdom, Congress generally has declined to preclude the President from controlling administration in this manner. FACT: In her article, Kagan did not even mention president's war powers or national security powers. At no point during her article did Kagan even discuss the president's national security or war powers. The unitarians would defend the practice simply by insisting, against the weight of precedent, that the Constitution provides the President with plenary authority over administration, so that Congress can no more interfere with the President's directive authority than with his removal power. I too defend the practice, but not on this basis. I accept Congress's broad power to insulate administrative activity from the President, but argue here that Congress has left more power in presidential hands than generally is recognized. More particularly, I argue that a statutory delegation to an executive agency official -- although not to an independent agency head -- usually should be read as allowing the President to assert directive authority, as Clinton did, over the exercise of the delegated discretion. FACT: Kagan stated that as solicitor general, she would defend federal laws and actions as long as there was a reasonable basis for them. In response to a written question from Sen. Charles Grassley (R-IA), Kagan stated: "As Solicitor General, my function would be to advance the interests of the United States, and the interests of the United States call for the defense of federal statutes against constitutional challenge whenever there is a reasonable basis for doing so." FACT: As a justice, Kagan's role would be to decide whether a government action was legal, not whether there was a reasonable basis for it. The Supreme Court, of course, often disagrees with the solicitor general's defense of the federal government's actions, as it did in numerous national security cases during the Bush administration, including in the 2004 cases of Hamdi v. Rumsfeld and Rasul v. Bush, the 2006 case of Hamdan v. Rumsfeld, and the 2008 case of Boumediene v. Bush. Senate Judiciary Republicans indicated Friday that if President Obama nominates Solicitor General Elena Kagan to replace Supreme Court Justice John Paul Stevens, he will have a fight on his hands. Multiple sources told The Daily Caller that Kagan lacks the judicial record that would enable them to have a vigorous debate about the law, and that of the three people most likely to be nominated, she is the least desirable. "A record like hers is harder to nail down than, say, a judge who has lots of opinions," one Republican staffer on the Senate Judiciary Committee said. "The debate is, or should be, really about the criteria." In recent years, Judge Roberts has left little in the way of a paper trail on the abortion issue, in legal writings or public speeches, which heightens the focus on his work as a deputy solicitor general. Abortion rights groups are trying to highlight those years, suggesting that President Bush has found an appealing ''stealth'' nominee with a hidden agenda. A measure of that trust, some Democratic and liberal strategists said, was the striking approval of the Roberts nomination by social conservatives and abortion opponents, in contrast to their reaction to the potential nomination of Attorney General Alberto R. Gonzales. Leading social conservatives said they were pleased with the selection. Dr. James Dobson, the founder of Focus on the Family, told reporters, ''I don't think there is any evidence that he is going to be another Souter,'' alluding to Justice David H. Souter, a Republican appointee whose rulings have disappointed conservatives. An e-mail message to supporters of the Christian conservative group American Family Association offered reassurance that Judge Roberts's deference to Roe as established precedent during his appellate confirmation hearing should not be held against him. CLAIM: Kagan's stance on the Establishment Clause could allow for discrimination against religious organizations. Days prior to Kagan's solicitor general confirmation hearing, Whelan cited as a cause for concern an October 22, 1987, memo "that Kagan wrote as a law clerk to Justice Thurgood Marshall" in which she supported a district court ruling "that the inclusion of religious organizations" in the Adolescent Family Life Act "violated the Establishment Clause." Whelan said of Kagan's 1987 memo: "If Kagan's current Establishment Clause views are anything like they were two decades ago, they ought to set off alarm bells for those who recognize that the Establishment Clause should not be misused to discriminate against religious organizations." An April 24 WorldNetDaily article cited Whelan's 2009 blog post as evidence of Kagan's supposed radical agenda. I indeed believe that my 22-year-old analysis, written for Justice Marshall, was deeply mistaken. It seems now utterly wrong to me to say that religious organizations generally should be precluded from receiving funds for providing the kinds of services contemplated by the Adolescent Family Life Act. I instead agree with the Bowen Court's statement that "[t]he facially neutral projects authorized by the AFLA-including pregnancy testing, adoption counseling and referral services, prenatal and postnatal care, educational services, residential care, child care, consumer education, etc. -- are not themselves 'specifically religious activities,' and they are not converted into such activities by the fact that they are carried out by organizations with religious affiliations." As that Court recognized, the use of a grant in a particular way by a particular religious organization might constitute a violation of the Establishment Clause -- for example, if the organization used the grant to fund what the Court called "specifically religious activity." But I think it incorrect (or, as I more colorfully said at the hearing, "the dumbest thing I ever heard") essentially to presume that a religious organization will use a grant of this kind in an impermissible manner. FACT: Rehnquist walked back his memo supporting Plessy v. Ferguson. As The New York Times reported, "In 1971, Newsweek magazine revealed that in 1952, Mr. Rehnquist, then a law clerk to Justice Robert H. Jackson, prepared a memorandum called 'A Random Thought on the Segregation Cases.' It was written in the first person and bore Mr. Rehnquist's initials. It urged Justice Jackson to reject arguments made by lawyers in Brown v. Board of Education, the landmark school desegregation case, and to uphold Plessy v. Ferguson, the 1896 Supreme Court decision holding that 'separate but equal' facilities were constitutional. Mr. Rehnquist wrote, 'I realize that this is an unpopular and unhumanitarian position for which I have been excoriated by 'liberal' colleagues, but I think Plessy v. Ferguson was right and should be re-affirmed.' " The Times further explained that "17 years later Mr. Rehnquist's memo created a storm. As opposition to Mr. Rehnquist mounted during the Senate debates, he submitted a letter to the chairman of the judiciary committee. 'I believe that the memorandum was prepared by me as a statement of Justice Jackson's tentative views for his own use,' Mr. Rehnquist wrote." During his 1986 confirmation hearings, Rehnquist repeated his statement that "the bald statement that Plessy was right and should be reaffirmed was not an accurate reflection of my own views at the time." SPECTER: Judge Roberts, the change in positions have been frequently noted. Early on, in one of your memoranda, you had made a comment on the "so-called right to privacy." SPECTER: This was a 1981 memo to Attorney General Smith, December 11th, 1981. You were referring to a lecture which Solicitor General Griswold had given six years earlier and you wrote, quote, that, "Solicitor General Griswold devotes a section to the so-called right to privacy; acquiring, as we have -- that such an amorphous arguing, as we have, that such an amorphous right was not to be found in the Constitution." Do you believe today that the right to privacy does exist in the Constitution? ROBERTS: Senator, I do. The right to privacy is protected under the Constitution in various ways. It's protected by the Fourth Amendment which provides that the right of people to be secure in their persons, houses, effects and papers is protected. It's protected under the First Amendment dealing with prohibition on establishment of a religion and guarantee of free exercise. It protects privacy in matters of conscience. It was protected by the framers in areas that were of particular concern to them. It may not seem so significant today: the Third Amendment, protecting their homes against the quartering of troops. And in addition, the court has -- it was a series of decisions going back 80 years -- has recognized that personal privacy is a component of the liberty protected by the due process clause. The court has explained that the liberty protected is not limited to freedom from physical restraint and that it's protected not simply procedurally, but as a substantive matter as well. And those decisions have sketched out, over a period of 80 years, certain aspects of privacy that are protected as part of the liberty in the due process clause under the Constitution. SPECTER: So that the views that you expressed back in 1981, raising an issue about "amorphous" and "so-called," would not be the views you'd express today? ROBERTS: Those views reflected the dean's speech. If you read his speech, he's quite skeptical of that right. I knew the attorney general was. And I was transmitting the dean's speech to the attorney general, but my views today are as I've just stated them. So they weren't necessarily your views then, but they certainly aren't your views now? ROBERTS: I think that's fair, yes. CLAIM: Kagan "would face extraordinary recusal obligations" if she became a Supreme Court Justice. Ed Whelan claimed that "if she were to make the transition from SG to the Supreme Court, Kagan would face extraordinary recusal obligations during her initial two or three years on the Court." REALITY: Kagan's recusal obligations would not be unusual. According to Supreme Court expert and SCOTUSblog writer Tom Goldstein, Kagan would likely have fewer recusals than Thurgood Marshall, the last solicitor general to become a Supreme Court justice, and no more recusals than Justices Clarence Thomas or Thomas Clark. Moreover, Goldstein wrote that Kagan would not have to recuse herself from a substantial number of cases after her first year on the bench. In no particular order, Kagan would have far fewer recusals principally because (i) she would be appointed earlier in the year, (ii) the Court's docket has fewer merits cases with the United States as a party, and (iii) a substantial amount of the time Marshall recused for reasons other than his service as Solicitor General. The best estimate is that in her first Term, Kagan would recuse from 13 cases. Beyond the numbers, Kagan's recusal would likely implicate only one arguably significant issue -- the government's litigation against tobacco companies. Goldstein also noted that Kagan might have to recuse herself from Guantanamo detainee cases: "I don't know but think that, depending on the precise case, it is possible that Kagan would recuse from some detainee-related matters, if they came to the Court." FACT: Supreme Court expert: Kagan's recusal obligations would not be significant in her second and third term. According to Goldstein, "commentators have assumed that Kagan's recusal obligations would continue to be very substantial for two to three years. That is not correct." Goldstein noted, "In his second Term, Marshall recused from 8 cases because he served as Solicitor General. The number for Kagan would likely be 5." He later added, "Absent an unusual circumstance, the greatest body of cases triggering recusal -- those in which Kagan actually participated in the Supreme Court as the Solicitor General -- would all be finalized during the upcoming Term. After that, her recusal would be triggered by cases in which she had the approval role, discussed above, which arrive at the Supreme Court far less frequently." CLAIM: Kagan's "record shows that she can become emotionally involved on issues she deeply cares about." Politico's Allen also claimed Kagan's "critics will say" that "her record shows that she can become emotionally involved on issues she deeply cares about," a completely baseless accusation. REALITY: Baseless "emotional" smear is a tired gender stereotype often used to attack women. Many prominent female figures have been attacked by invoking the stereotype that women are too emotional. FACT: The Handbook of Social Psychology lists as one "gender stereotype" that "women are (too) emotional." The Handbook of Social Psychology -- edited by Daniel T. Gilbert, Susan T. Fiske, and Gardner Lindzey and described by its publisher as "the standard professional reference for the field of social psychology for many years" -- cites being too "emotional" as a gender stereotype applied to women: "In addition, the content of gender stereotypes is heavily prescriptive -- that is, telling how men and women should behave. Men should be competent; women should be nice. Other gender stereotype content is more descriptive: Men are (too) aggressive; women are (too) emotional" [Page 378]. FACT: Sotomayor's intellect and temperament were attacked using gender and racial stereotypes. As Media Matters noted, Supreme Court Justice Sonia Sotomayor's critics frequently employed gender and racial stereotypes in attacking her temperament and intellect. Conservative media figures and others would attack Sotomayor as being an "angry" justice who is a "bully" and "not that intelligent," which many argued reflected negative stereotypes about women and Latinos. FACT: Pelosi's judgment was attacked as being "based on emotions and not good sense." Following Democratic victories in 2006 that paved the way for Nancy Pelosi to become the first female speaker of the House, many media figures trotted out tired, gender-based stereotypes in discussing Pelosi's judgment and leadership. For instance, as Media Matters noted, CNN political analyst Bay Buchanan asserted that Pelosi's "judgment is based on emotions and not good sense." FACT: During presidential campaign, media diagnosed Clinton with "mood swings," depression and "multiple personality disorder." As Media Matters documented, during the 2008 presidential campaign, Hillary Clinton was often the subject of sexist attacks and commentary, with members of the media asserting that she displayed "mood swings," "could be depressed," "[r]esembl[ed] someone with multiple personality disorder," and "has turned into Sybil," an apparent reference to a book and movie about a woman who developed multiple personality disorder after being severely abused as a child. CLAIM: Kagan does not have "the proper temperament to be a judge" and her record is "not of a fair-minded, impartial judge." In his May 9 "Playbook," Politico's Mike Allen wrote that "critics will say" that "there is nothing in [Kagan's] record to suggest she has the proper temperament to be a judge. ... Her record is one of an advocate and an activist, not of a fair-minded, impartial judge." REALITY: Kagan has been widely praised by conservatives and legal experts for her "fair-minded" temperament. Numerous conservatives and legal experts have praised Kagan's "fair-minded consideration" of all viewpoints and the respect with which she treats those with whom she disagrees. Some years ago, it came Harvard Law School's turn to host the national convention of the student chapter of the Federalist Society. There was a dinner of some 1,000 guests from all over the country and it was her duty as dean to offer the welcome to our many guests. When she rose she was greeted by prolonged and thunderous applause. Enduring it for awhile, she finally raised her hands -- a big grin on her face -- and said "You are not my people...." There was loud and friendly laughter in the hall, almost drowning out her next words: "But I love the Federalist Society." This was met by applause more lively and prolonged than before. I would guess she loves the American Constitution Society too, but I do not go to those meetings." FACT: Bush judicial nominee Estrada said Kagan's time at Harvard proves she is "someone who can create consensus," praised her for "work[ing] tirelessly to bring intellectual diversity" to the school. In a letter supporting her nominations for Solicitor General, Miguel Estrada -- who Bush nominated to be a D.C. Circuit judge -- stated that Kagan's "tenure as Dean [of Harvard Law School] demonstrates that she is a uniquely gifted administrator -- someone who can create consensus even in an institution that had become notorious for its fractiousness. For good measure, she has worked tirelessly to bring intellectual diversity to an institution that for too long had too little of it." FACT: Bush official and judicial nominee Keisler praised Kagan's "way of dealing respectfully with everybody." Former Bush Justice Department official and D.C. Circuit nominee Peter Keisler wrote in support of Kagan's nomination to be solicitor general: "I am confident that it is precisely this combination of strong intellectual capabilities, thoughtful judgment, and her way of dealing respectfully with everybody that enabled her to become such a unifying and universally respected figure at Harvard." FACT: Bush assistant AG Goldsmith spoke of Kagan's ability to judge problems "without ideological suppositions." In a letter supporting Kagan's nomination for solicitor general, Jack Goldsmith -- former assistant attorney general for the Office of Legal Counsel during the Bush administration -- stated: "Good judgment is a hard quality to describe, but Kagan has it. She understands problems in all their dimensions, she thinks about them clearly and without ideological suppositions, and she has a knack for understanding well the consequences and ramifications of various courses of action." He added: "Her success at Harvard also resulted from her shrewd ability to bridge disagreement. Kagan does this by listening to all sides of an argument, by engaging interlocutors honestly and empathetically, and by exercising her judgment openly and with good reasons." Simultaneously respectful of the views of others and capable of diplomatically identifying and correcting gaps in their understanding, Elena Kagan is the ideal advocate for an administration that seeks common ground among partisan opponents and that must grapple with the most difficult domestic and foreign challenges any incoming President has had to face in many generations. FACT: Former assistant solicitors general: "Kagan is a person of great legal and personal skills, intellect, integrity, independence, and judgment." Six former assistant solicitors general -- four of whom also served as deputy solicitors general -- wrote: "In sum, Dean Kagan is a person of great legal and personal skills, intellect, integrity, independence and judgment. We therefore believe, based on extensive personal experience, that she has all the attributes that are essential to an outstanding Solicitor General."